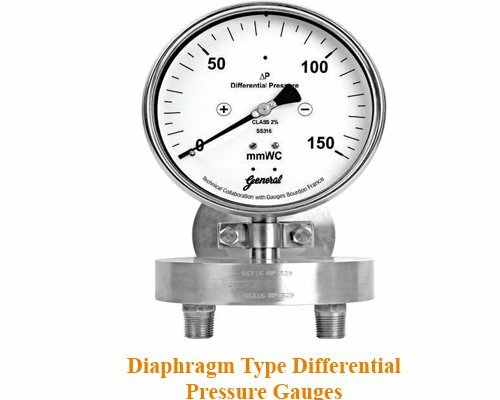 Types: Variety of models based on sensing elements such as diaphragm, bellow, Capsule, etc. are available. 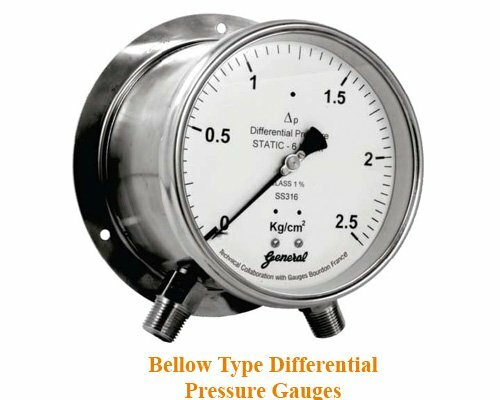 Bellow type Differential Pressure Gauges are available with 6” dial size and accuracy of +/-1% FSD as standard and static pressure of 100 Kg/cm2. 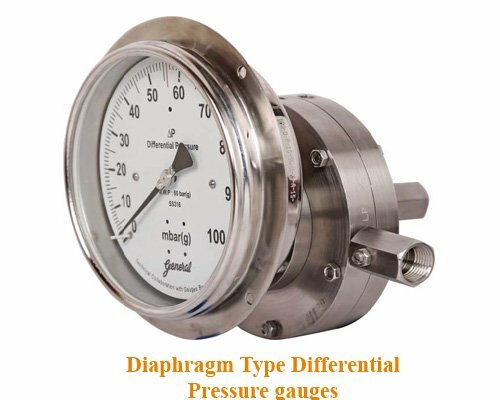 Diaphragm type Differential Pressure Gauges models are available with 4” and 6” dial size with single and double diaphragm elements and accuracy of +/- 2% FSD standard and +/- 1.6% on request. 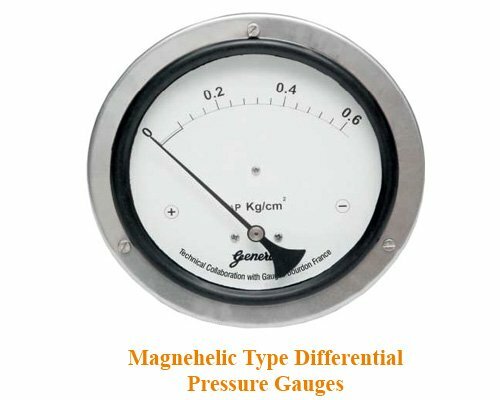 Magnehelic Differential Pressure Gauges are available with dial size 4” and 6” dial size, minimum range 0 – 100mmwc and static pressure upto 100 Bar. 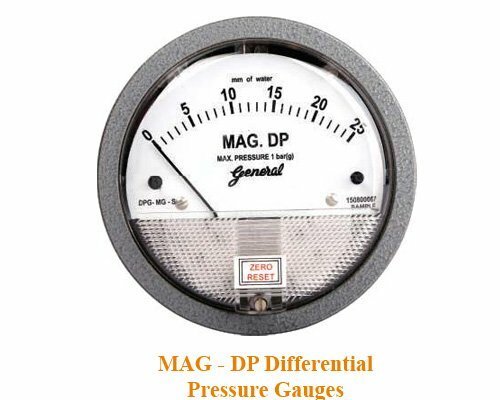 Mag DP Gauge model is especially designed for pharma applications with very low ranges of 0 – 6 mmwc to 0 – 25 mmwc. Pl. 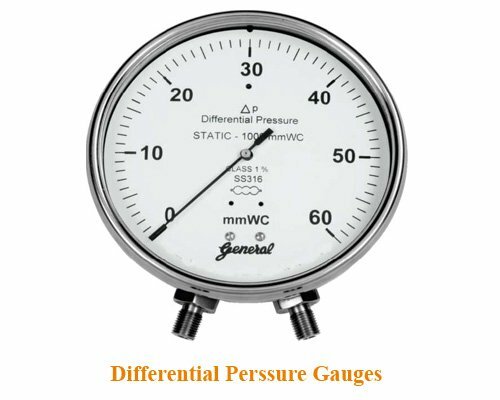 refer our catalogues for different models of DP Gauges designed based on combinations of Differential Pressure range, operating pressure and static pressure. 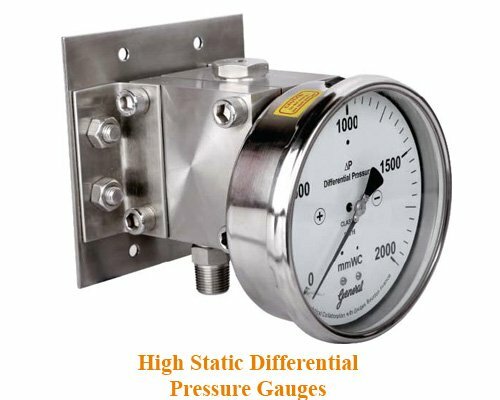 Range: Differential Pressure Gauges designed for low DP range as 0 – 60mmwc and above various combinations of DP ranges and static pressure maximum upto 400 Kg/cm2 is available for industrial process applications. The latest IP-68 protection is offered as standard feature for all gauges. Accessories: Gauge Saver, Manifold Valve, pointer puller and fixture kit, etc. Special Features: Maxima pointer, NACE Compliance, Colour band, dual scale range, liquid filed case, O2 (oxygen cleaning), N2 (Nitrogen cleaning), blow out disc at back, vacuum protection, capillary extension, micrometer pointer and many other features. Unique design of external zero reset Knob for liquid filled Differential Pressure gauges wherein zero can be adjusted without opening the case and bezel and draining the liquid filling from case. This special feature is developed by GIC and essentially demanded by oil and gas / hydrocarbon industry onshore and offshore.